Lightning Powder 1-0143 Model 200 Crime Scene Kit FREE SHIPPING! This comprehensive kit works well for latent print examiners and crime scene investigators. 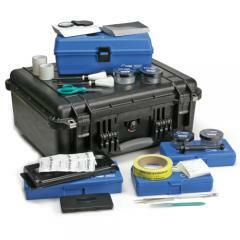 It has all the items that the Model 100 and Model 100 Plus Crime Scene Kits contain, as well as a full fingerprinting kit in it's own kit box and a large, sturdy Samsonite briefcase. The reason for the individual boxes within the larger briefcase is for convenience of use. One person carries in the briefcase but more than one person can take the smaller boxes out to perform different functions around the crime scene. One person can be dusting for latent prints with regular powder, another can be dusting for latent prints with magnetic powder, another can be rolling elimination prints and a fourth can be collecting evidence. ©2002-2019 CopsPlus.com: Lightning Powder 1-0143 Model 200 Crime Scene Kit FREE SHIPPING!